Germany Year Zero is the last act of the confession: it is acceptance in full of the drama, which therefore occurs later, when things have already changed, when the politics of ‘washing dirty linen’ has already begun. … all that was necessary was a new type of tale capable of including the elliptical and the unorganised, as if the cinema had to begin again from zero …. It seems an apt time to be screening a film such as Roberto Rossellini’s Germany Year Zero as the war in Iraq draws to a close and disputes over the post-war management of the nation take on a disturbing shape. 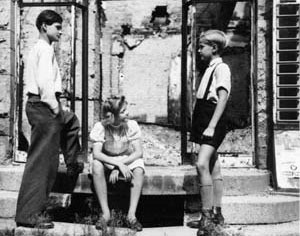 Centring on the experiences of a young German boy wandering the streets of Berlin after Allied liberation, Germany Year Zero escorts us about a city excavated by bombs and missiles – a city constituted almost entirely of rubble. Watching Germany Year Zero while images of Bagdad relentlessly penetrate my living room, I cannot shake off the uneasy feeling that in the ruins of one city I see ghosts of the rubble of the other. As Saddam Hussein’s presidential compound was occupied on April 7th of 2003, Fox News in the US ran live footage from the steps of the Republican Palace. Witnessing this media event, it became clearer to me than ever that Rossellini’s trademark immediate response to contemporary events has become the norm of mainstream media coverage. Rossellini himself began making films for the Fascist regime in Italy at the beginning of World War Two. However, Germany Year Zero is not a documentary about the war. Nor do we trust that what is displayed on our TV networks in times of war is any less a fiction. According to Bazin, Rossellini’s cinema does not simply offer us social-realism in the post-war context (as his Italian critics claimed) but a new approach to the real that undoes the determined spaces and conventions of the old cinematic realism. Rossellini describes himself making Germany Year Zero as “making an effort… to understand events that had involved me personally, and that had overwhelmed me.” For Rossellini, Germany Year Zero is less an exploration of historical facts than an exploration of “attitudes, of types of behaviour determined by a particular historical climate or situation.” (5) In contrast, we could say that a kind of ‘action cinema’ structure dictates the way our mainstream media coverage is edited. Deleuze tells us “We have schemata for turning away when it is too unpleasant, for prompting resignation when it is terrible.” (6) Rossellini, however, is not interested in allowing us this immunity, delving into what is immediate and painful to him in an attempt to come to terms with it. According to Deleuze, this experience of being overwhelmed by what is immediate and painful makes the sensory-motor schemata of ‘action cinema’ “jam or break” unsettling both character and spectator. (7) At the end of Germany Year Zero, Edmund stands atop an abandoned building and looks out over the streets of Berlin, an overwhelmed and exhausted spectator on the city. Through his experimentation with cinematic form, Rossellini transfers to the spectator the bodily and emotional experiences of those recovering from the shock of war. Indeed, while mainstream reportage operates all kinds of cliched evasions, Rossellini’s cinematic experimentation enables us as spectators to develop our capacity for compassion. And we need this at the present time, perhaps more than ever. Stefano Roncoroni (ed. ), introduction to The War Trilogy, trans. Judith Green (New York: Grossman, 1973) xi. Gilles Deleuze, Cinema 1: The Movement-Image, trans. Hugh Tomlinson & Barbara Habberjam (London: The Athlone Press, 1986), 211. André Bazin, “In Defense of Rossellini,” a letter to Guido Aristarco, editor-in-chief of Cinema Nuovo, reprinted in What Is Cinema? vol.2, ed. and trans. Hugh Gray (Berkeley: University of California Press, 1971), 97. Roberto Rossellini, “The Intelligence of the Present,” which also provides an introduction to The War Trilogy, xvi. Germany Year Zero is dedicated to Rossellini’s son Romano, who died prematurely in 1946 and who was similar in age and appearance to the German boy in the film. Gilles Deleuze calls these “sensory-motor evasions” in Cinema 2: The Time-Image, trans. Hugh Tomlinson & Robert Galeta (Minneapolis: University of Minnesota Press, 1989) 20. Rossellini describes his approach to editing in an interview with Fereydoun Hoveyda and Jacques Rivette published in Cahiers du Cinéma 94 (April 1959): 213. Bazin provides an effective description of the consequences of this style of cutting: “The mind has to leap from one event to the other as one leaps from stone to stone in crossing a river. It may happen that one’s foot hesitates between two rocks, or that one misses one’s footing and slips. The mind does likewise.” (35). Rossellini interviewed by Eric Rohmer and François Truffaut in Cahiers du Cinéma 37 (July 1954). Rossellini, The War Trilogy, xvii.